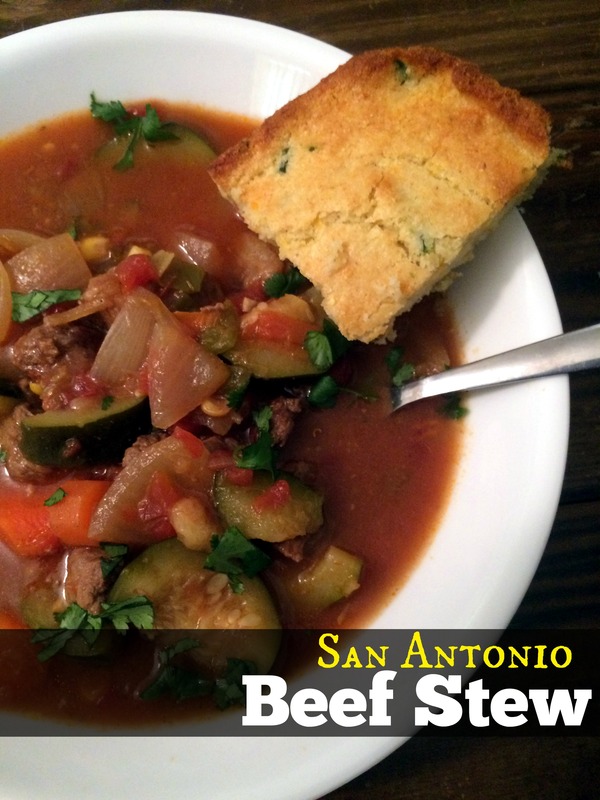 I found this recipe for San Antonio Beef Stew in a cookbook full of Texas style recipes. It sounded so good! (We LOVE Tex-Mex!) 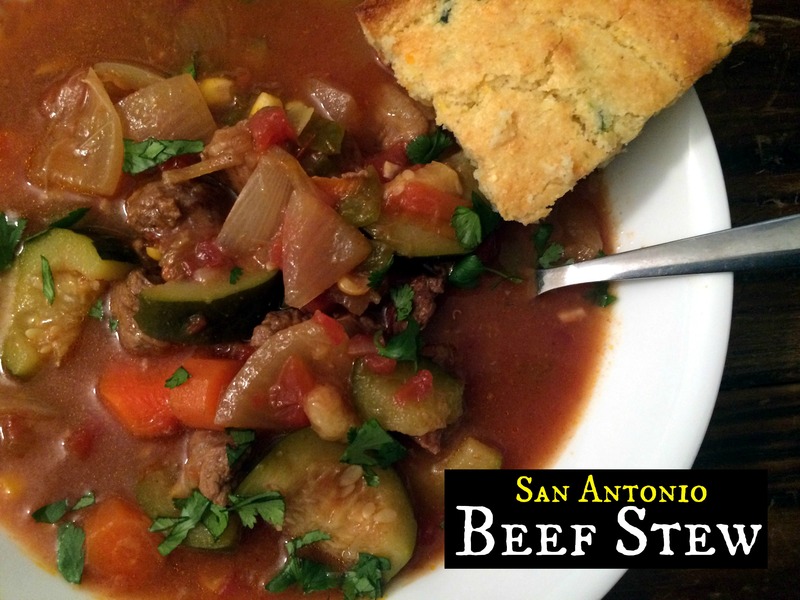 My son was sick with a cold this week and soup is one of his favorite meals so I made it for dinner along with our favorite Sweet Jalapeno Cheddar Cornbread. This was so SO delicious! I made it on the stove top but it would be a great one for the slow cooker as well! Brown stew meat in oil in a large soup pot. Add garlic for the last minute, stirring well. Add broth, tomatoes in juice, picante sauce, onions, carrots, zucchini, corn, salt & cumin. Bring to a boil, reduce to simmer and cover for 1.5 hours, stirring occasionally. Combine cold water and flour and whisk with fork until smooth. Add flour slurry to soup and cook for 15 minutes longer or until thickened. Adjust seasonings to taste and serve with toppings of your choice and Sweet Jalapeno Cheddar Cornbread! Enjoy! I brown my stew meat if I have time but you can skip this step. Combine everything from stew meat to the cumin in the slow cooker. Cook on low for 6 hours. Mix the cold water and flour and stir until smooth. Add flour slurry to slow cooker and continue cooking on low for 15 minutes or until thickened. Adjust seasonings to taste & serve with toppings of your choice and Sweet Jalapeno Cheddar Cornbread! Enjoy!